Now, to the winner of the worst possible sentence from last weeks writespiration, and boy did we have some cracking entries. And by cracking, I mean awful! Helen Jones new to writespiration, gave a stonking effort with this terrible opener. If my wife had been choosing the winner, Helen would have won 🙂 – it made Mrs. Black laugh out loud. Why is silence so deafening? It ached in my ears, the pounding silence swallowed up any thoughts I had. It hurt. Hurt like the loss of my parents. No more voices to call me in at the end of the day. No mother to shout upstairs “dinners ready.” Just endless silence. Thanks for the honourable mention, Sacha. It depressed me writing it! I love starting prompts with just one word. There are so many possibilities. Thanks for the prompt! Hi Sacha, thanks for the honourable mention – that’s awesome 🙂 and I’m glad I made Mrs Black laugh. Hmm. Not sure that I didn’t take a bit of a segue into ‘time’. Oh well. 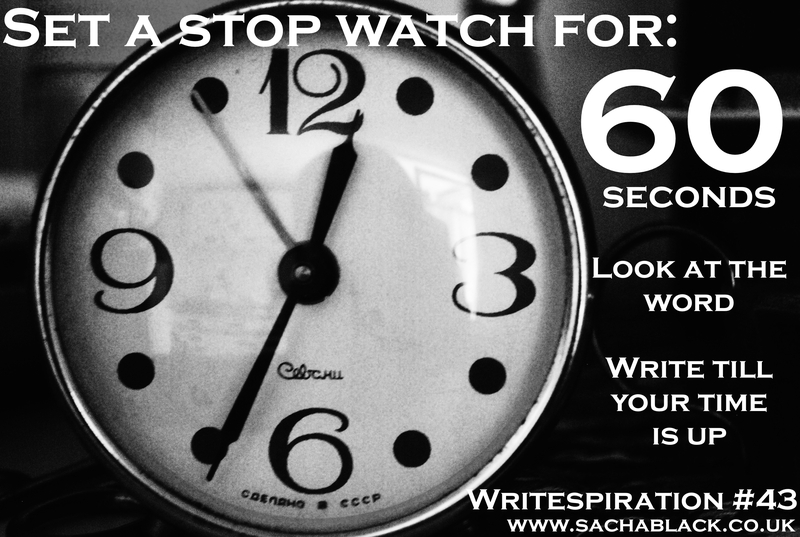 Ok Sacha, I will give your sixty seconds a try. oh my gosh, how heart wrenching and emotional. I love it. Thanks SOOOOO much for joining in 🙂 Im chuffed you joined in 🙂 and its a fab entry too. Yes, I love these timed challenges where we can let the mind go wild. I am SO thrilled that my talent for putting readers off in the first sentence has at last been recognised 🙂 Thank you Sacha. Here’s my go at the stop watch thingy. Well, that wasn’t very long, was it? What happens when you don’t have a stop watch and your phone only stays lit up for five seconds at a time so you have to keep stopping to peer and the clock. Had to try this one. Thanks for the writespiration. 🙂 Off to read the comments (didn’t want to see the word ahead of time). Absolutely LOVE Helen’s first line. Truly. Brilliant.